Whenever another character plays barbarians, Zhu Rong is not affected. After all other effects have been concluded, Zhu Rong places the card in her hand. Whenever Zhu Rong damages another character with an attack, she can compete with the character. If she wins, she can take one of their cards and puts it in her hand. If both Cao Cao and Zhu Rong are in play and Barbarians is played, Cao Cao's "Evil Hero" takes precedence over Zhu Rong's "Giant Elephant." 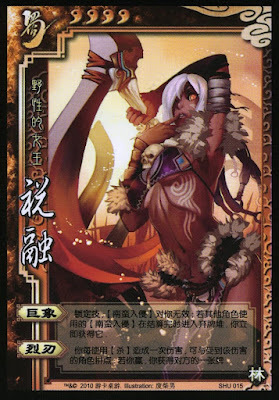 Note that Zhu Rong's power states that she does not place the card in her hand until "after all other effects have been concluded." If multiple characters are Chained together and Zhu Rong hurts one character with an elemental Attack, she can compete with each of the victims immediately after each one is damaged for "Intense Edge." "Intense Edge" goes into effect before damaged-activated abilities, like Guo Jia's "Heaven's Envy" or Sima Yi's "Feedback." If Zhu Rong wins the competition for "Intense Edge," she can take any of her opponent's cards, including equipped cards but not pending judgement cards. "Giant Elephant" is both an offensive and defensive power, as it protects Zhu Rong from the damage and allows her to pick up the card an play it again during her turn. "Intense Edge" can be devastating for Zhu Rong's opponents. The enemy is damaged, loses one card in the competition, then possibly loses an additional card to Zhu Rong if they lose the competition. This power is even worse if Zhu Rong has the Gender Swords and Attacks a male opponent. While "Intense Edge" is very costly for her opponent, Zhu Rong must also spend two cards to activate it (the Attack and the additional card for the competition). This power may backfire if Zhu Rong loses the competition, as she wasted her competition card (granted, the opponent also loses a card in the competition). "Giant Elephant" is a great power, but it may not be advantageous for Zhu Rong to use the Barbarians card if it will weaken her teammates. Cao Cao - Cao Cao and Zhu Rong can set up a loop with Barbarians. When Zhu Rong plays Barbarians, Cao Cao can choose to take the damage and put the card in his hand. When Cao Cao plays the card, it automatically goes into Zhu Rong's hand. Over time, this combination can wear down all of the other characters, provided that Cao Cao has a lot of health. Lu Xun/Zhang Chun Hua - These characters have powers that mandate a certain number of cards in their hand. When they run out, they automatically draw more. This will provide them with a defense against "Intense Edge." King Zhu Rong is sometimes chosen as the king when playing online, but she does not seem to be very well suited for this role. "Giant Elephant" only provides her with a defense against Barbarians, so she is still open to Attacks and other types of assaults. Loyalist Zhu Rong is a great loyalist if the king is Cao Cao for reasons previously specified. She can also be useful with Liu Bei and Liu Shan since she can play Barbarians and respond with an Attack for them. However, "Giant Elephant" is not useful for other kings if they are low on health. For these other king choices, Zhu Rong is more or less an average loyalist choice. Rebel Zhu Rong is a great rebel choice. "Giant Elephant" will ensure that the king must respond twice to each Barbarians card while "Intense Edge" is great for card/hand destruction. Spy Zhu Rong seems to be a competent spy choice. If she can collect enough Barbarians cards, she may be able to kill several people in one turn. However, it may be difficult to rely on this power to give one side an advantage when the other is dominating. In cases like these, it is better to try to Attack members of the winning team to try to activate "Intense Edge." Zhu Rong is an interesting character. She is a female character with four units of health (all other official female characters have three health). Unlike most other four-health characters, she has two significant powers. Ma Chao and Pang De have four health and two powers, but one of these powers ("Horsemanship") is simply the addition of a -1 horse. Zhu Rong's husband Meng Huo also has four health and two powers, but one can argue that "Culprit" often causes problems for him. In Zhu Rong's case, both of her powers can be incredibly useful, even if they are not always perfect, and do not negatively impact her when she uses them correctly.